An Italian cruise ship left adrift in the Indian Ocean with more than 1,000 people on board following a power failure has been taken in tow. A French fishing vessel (Trevignon purse seiner) is taking the Costa Allegra to a small island in the Seychelles, where it is expected to arrive on Wednesday. A fire in the ship's generator room on Monday caused it to lose all power. The ship is from the same fleet as the Costa Concordia, which capsized off the Italian coast in January, killing 32. 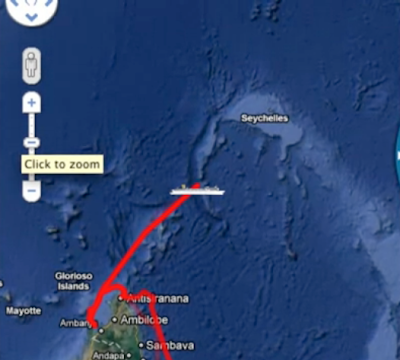 Officials said it was around 20 nautical miles from tiny Alphonse Island, part of an atoll that officially belongs to the Seychelles and is known for its white sandy beaches and dense forests, as well as tortoises and rare birds. The BBC's Katy Watson on the Seychelles says that the ship is being towed to Desroches island, near Alphonse island, at the south-west end of the Seychelles. Tugs sent from Mahe were due to meet the Costa Allegra at around 0900 GMT, our correspondent adds. The vessel has no air-conditioning or cooking facilities and an emergency generator powering the radio "could fail at any minute", the Italian coast guard says. The ship's owner, Costa Cruises, has stressed that the Allegra - which had been drifting about 32km (20 miles) from Alphonse island - is steady and conditions are safe. No-one has been injured, officials said. The company says it is liaising with passengers' families via their emergency contact numbers, and has reached two-thirds of them. Contact has been made with the relatives of all the crew. The ship is at the southern end of the seas that are vulnerable to attacks by Somali pirates. But a government spokesman told the BBC that attacks in the area had decreased in the past year as security improved. 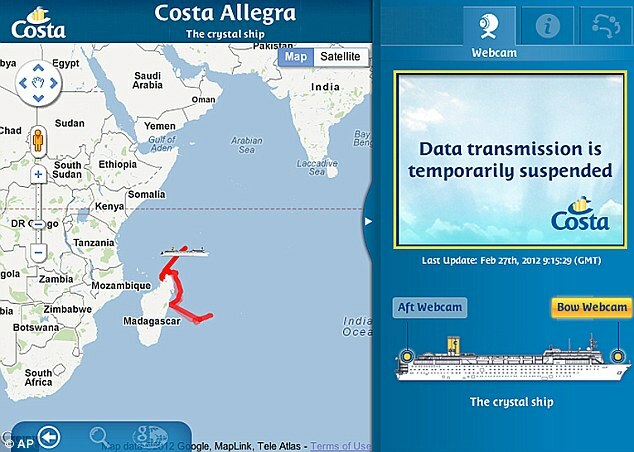 A facility on Costa Cruises' website allowing people to track the Allegra's position says that "data transmission is temporarily suspended". The company says the Allegra received its regularly scheduled maintenance in dry dock in October 2011.